The new residency management system. Upon arrival you’ll receive one year student visa (or one year three months) which can be extended another one year during your stay in Japan. Immigration examination : At Narita and Haneda Airports, besides having a seal of landing verification stamped in your passports, mid- to long-term residents will be issued a residence card (zairyuu-card). With the new residency management system, permission to engage in an activity other than that permitted under the resident status may be given at airports. A residence card(zairyuu-card) will be issued at Narita and Haneda Airports when the new system is enforced in July 9th, 2012. Students in possession of a valid passport and residence card who will be re-entering Japan within two months of their departure to continue their activities in Japan will, in principle, not be required to apply for a re-entry permit. The immigration office will not justify your absence for two months or more. (if you are students) Be sure to contact us if you are going to absent for three days or more from the class. In the worst case we will have to dismiss you. After receiving the residence card, you must visit the City/Ward Office of your residence within 14 days to register your address in Japan. In case you return to your country, it is possible to bring your residence card as a souvenir. If you get confirmation of embarkation without re-entry permit (including special re-entry permit) at a port of departure, you are required to return the residence card, but it will be return to the person after a hole is made in the returned residence card for invalidation. For students, this system can be used during summer vacation or winter vacation. 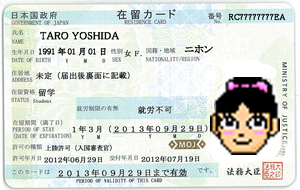 Take your residence card with you when leaving and re-entering Japan. Immigration officers will ask you to present your residence card at the port of departure/ re-entry. When you leave Japan, be sure to present your residence card and tick the column indicating your intention of departure by the Special Re-entry Permit System on an ED card for Special Re-entry Permit. Be sure to tell your teacher and the school office when you leave Japan. zairyucard Wish the new residency management system, permission to engage in an activity other than that permitted under the resident status may be given at Narita and Haneda Airports (where residence cards are issued), to persons to whom all the following apply. 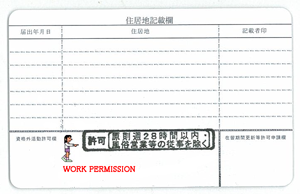 Those who are granted “Student” status and to whom a residence card (zairyuu-card) is issued. With a student visa you are permitted to work up to 28 hours a week at a paid position, after obtaining permission from the Immigration department. Permission is usually granted once you have a command of basic Japanese. As the economy in lukewarm in Japan currently, finding a job will typically require a certain amount of effort on the part of the student. Many students work in restaurants and shops and this often requires a mastery of basic Japanese, so beginning students may not be able to find work until their command of daily Japanese has improved. However, students often find that jobs help their Japanese as they use it in everyday work situations and not just in the classroom. English speakers frequently find work teaching English. When you arrive at Yoshida, we’ll be happy to talk more with you about the procedures for getting approval to work and any job possibilities we’re aware of at the time. 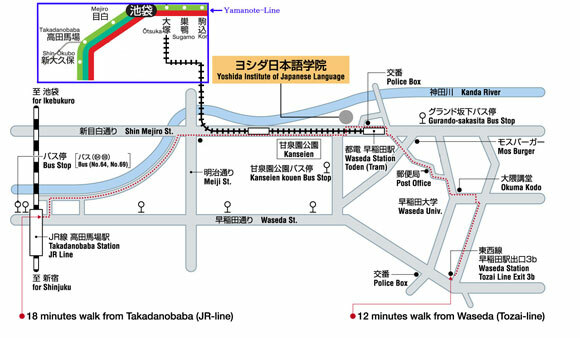 From Narita Airport, take the Airport Limousine Bus to Ikebukuro.We will meet you at Hotel etropolitan(Ikebukuro). Please ask us for pick up details if you are arriving in Ikebukuro.Limousine bus has bus services from Narita Airport to Ikebukuro 19 times per day. The manager of the dormitory will meet you at the airport. One of our representatives will greet you at Narita Airport to the dormitory by car or train. (Pick up for 6,000 yen per person). From Narita Airport, take the Skyliner to Nippori and change to the JR Yamanote line. Trains stop in Otsuka (four stop) and change to the Toden Arakawa line. Please go down at terminal Waseda Station. There is our school in front of Waseda Station. From HANED Airport, take the Tokyo Monorail Line to HAMAMATSUCHO and change to the JR Yamanote line. Trains stop in Otsuka (one station before Ikebukuro) and change to the Toden Arakawa line. Please go down at terminal Waseda Station. There is our school in front of Waseda Station.